Vincent Kompany and the Man City players with the Carabao Cup trophy. KEVIN DE BRUYNE has played down Manchester City’s quadruple prospects after they beat Chelsea in the League Cup final but admitted such an achievement would make them the “best team ever”. But asked if Pep Guardiola’s men could win all four trophies on offer, midfielder De Bruyne said it would be “almost impossible”. “If you do that you must be considered the best team ever because nobody has done it,” he said. Alex Ferguson’s Manchester United won the treble of Champions League, Premier League and FA Cup in 1999 — a unique feat in English football. 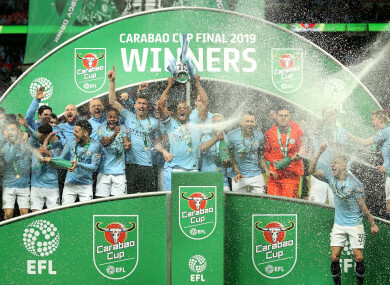 City’s latest trophy, their fourth League Cup triumph in six seasons, came via a penalty shootout after a drab clash ended goalless after 120 minutes. Email “Winning the quadruple would make Man City 'the best team ever' - De Bruyne ”. Feedback on “Winning the quadruple would make Man City 'the best team ever' - De Bruyne ”.